We celebrated Charlie's 20th anniversary with SAIC today at Cozymel's Mexican restaurant, with 10 or 15 coworkers in attendance. 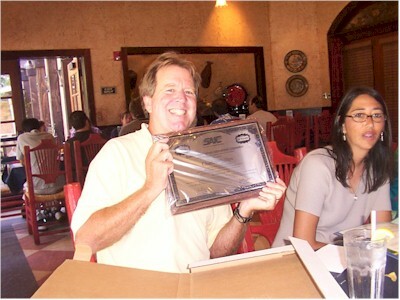 The company's gift for a 20-year employee is an engraved copy of a stock certificate. Unfortunately, it doesn't have any value, but it's nice anyway. The food was great and it was nice having lunch somewhere other than my office or car. I had sea bass and plantains wrapped in a banana leaf. I could have done without the leaf, but it was more interesting that way, I guess.